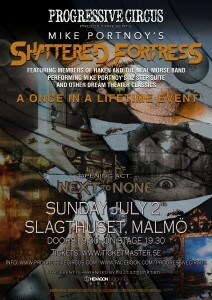 You all know Mike Portnoy as the legendary drummer and co-founder of Dream Theater from 1985 to 2010, but he has been or is also a member of prestigeous acts like Transatlantic, Liquid Tension Experiment, The Neal Morse Band, Twisted Sister, The Winery Dogs, Flying Colors and Avenged Sevenfold to name some. On his CV there are 30 awards from Modern Drummer and he has been the Drummer of the Year according to Metal Hammer, Revolver, Drum! and Modern Drummer, alongside Rhythm listing him as the fifth best drummer of all times. So, basically, the guy can drum. To celebrate his 50th birthday, Mike put together Mike Portnoy’s Shattered Fortress to headline the amazing festival Cruise to the Edge 2017, where the band performed Dream Theater’s ”12 step suite” live in it’s entirety for the first time. The suite consists of five songs released on the albums from Six Degrees of Inner Turbulence (2002) to Black Clouds & Silver Linings (2009), and tells Mike’s personal story about his journey from alcoholism to sobriety through AA’s 12 step method. The attraction value of Mike revisiting Dream Theater material was apparent, and the band was soon booked as first or second headliner for Europe’s biofficialggest and best prog festivals, Night of the Prog and Be Prog my Friend!, plus concerts on the continent between those dates. However, when the tour was already booked and announced we couldn’t resist making the best effort possible to squeeeeeze in a Malmö date for the PC fans. With a little grease and lots of wonderful goodwill from Hexagon Booking Agency & the tour manager we managed to fit in two long bus journeys and a gig between Paris and Luxemburg, and here we are! The mega competent band consists of Eric Gillette from The Neal Morse band on guitars and all of Haken’s non-drumming members (Connor Green on bass, Diego Tejeida on keyboards, Richard Henshall and Charlie Griffiths on guitars and Ross Jennings on vocals). Well, apart from Mike, obviously… Expect the 12 step suite and other DT classics where Mike has written the lyrics. The opening act is Next to None, featuring Mike’s son Max on drums, who carry the torch high for leading progressive metal into the future and beyond. You are extremely welcome to spend July 2nd with us & MPSF – it will be a memory for a lifetime!